Finally, I received the new bento book copy of Yum-Yum Bento Box by Crystal Watanabe (Pikko) and Maki Ogawa (Luckysundae) yesterday. I have been waiting for this book and made the pre-order since it was available at the Amazon online store. In the bento world, the big name of Pikko and Maki are very well known because of their amazing works, ideas, arts in bento making. They have become an inspirators for so many bento makers through their blogs. Yum-Yum Bento Box is their first bento book written in English. I find it very helpful because it is easy to read and understand in English. As soon as I open the first page, I already felt in love with this book. Inside this book you can find so many ideas, recipes, tips, and information that will be a great help to create a cute and beautiful bentos. The other thing that makes this book worthy to have is the beautiful photography by Maki and the colorful design in this book. Those facts make this book very interesting and fun to read in every single page. At the back of this book you also can find additional recipes for mini snacks and save-it-for-later lunches, shopping guide, glossary, and metric conversion chart. I highly recommended this book to all of you that love bento, whether you just started your bento making or are already advanced level. If you would like to buy this book, you can find the list of stores at the official website for Yum-Yum Bento Box. 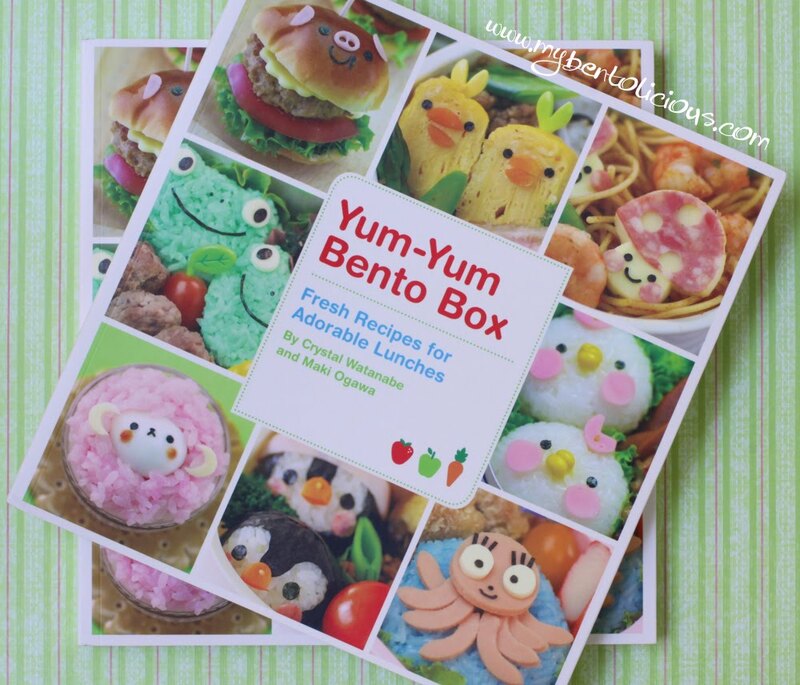 Since I have 1 extra copy, I will giving away this 1 extra copy of Yum-Yum Bento Box book !! All you need to do is just leave your name and e-mail address and the reason why you like bento in the comment box. You can leave your comment until 27 June, 2010. My daughter will choose the winner randomly. 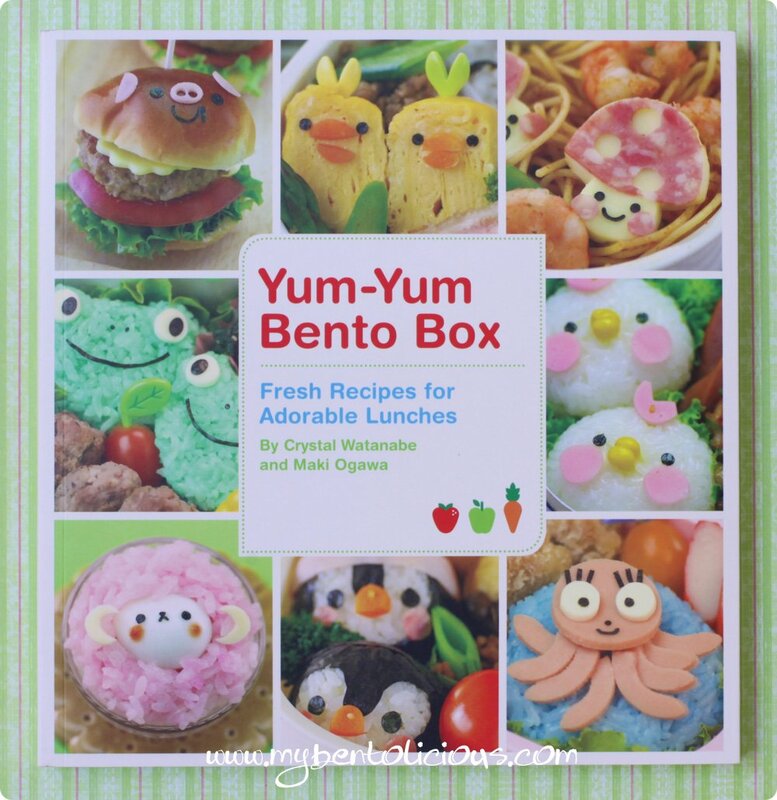 So don't miss you chance to win this great bento book! Wow, this is a great gift! I wish I have the chance to win this book because I can’t find any bento related books in bookstores in Penang, Malaysia :( I even searched in some bookstores when I travelled to Hong Kong last week but I didn’t see any. Haven’t decided to purchase through online because the shipping fees are too expensive for me. Thanks for giving away this extra copy of yours so that people like me will have a chance to win this book! Wish me luck!!! I’ve been making bento for my husband. The reason I like bento is because they look cute and are packed with healthy food. Ever since I start making bentos for my husband, he enjoys his lunch time so much. He said the decorations in the bentos always put a smile on his face and that’s the only time he can relax his mind during his long working days. I’m addicted to making happy and healthy bentos for my husband! Hi Lia...ow...the book looks adorable...! I like bento because aside from expression of love from mothers to children, it also provides healthy and delicious homemade food for kids and adults. Mbak Liaaaaaa.... you're back! Miss you soooo much! :D. Yoohooo.... this book giveaway is way tempting for me *you know the reason lah hehehe*. Okay here we go, I love bentoing since I can get a genuine happiness through it. It also can challenge my creativity in making food ingredients in a cute way. Through bentoing too, I can so many love and great friends :D.
I love bento. Why? That's a good question. I think because it is a healthy way to pack lunches. First I liked to make them for myself. Especially for weekend seminars at my university. That was why I started ;)Now so much has changed. I'm finished with my studies. But I still do some bento. I feel satisfy every times I make something cute for my lovely husband. I'll learn more cute shaper of food through this book. Hey Lia, you are back finally! Miss your post and bento so much! I love bento-ing just simply because it give me so much pleasure when I managed to prepare something cute and healthy for my kids and especially when they appreciate it! Plus I make so many friends just because of making bento. Lia lia lia...dear...how hv u been doing? busy with the new house, i suppose? The reason why ?.. *think think think*..well, doing bento, giving me so much joy, whenever i do every detail for the one I love, and thinking that all the cute and healthy food that I prepare will bring smile on them.. (n the people around them..^_^), that brings me happiness also.. Other than that,..I've many friends around the world because of bento, and knowing a great bento artist like you Lia, is a bonus! I really love bento because I can use them everyday to make a tasty and healthy meal that I always love! Moreover, I knowthat I'm always getting the right amount of food everyday and it's good to know that I won't have too much nor not enough :). Hi Lia, how are you? I miss your posts too! WOW! So happy that you're giving away this new book. As you know I'm very new to bentos and very much inspired by you and the other bento friends. How I wish I can have this book to help me along. Why I would like this book? (1) I'm a beginner, (2) there are no bento related books here in Hungary, and (3) and I'm sure there are lots of great tips in the book. Wow Lia what a sweet thing to do. This book would be a great addition to anyones bento library. Good luck to every one. I love bento because I've always been a creative person and a lover of anything cute, which means not just the idea but also the bento boxes, utensils, and accessories. More importantly, I love bento because my daughter started school this past year, and cafeteria food in the US is horrible. I could never let her eat lunch at school every day. My daughter is a little picky when it comes to eating, so taking what she really likes and making nice presentation helped her to look forward to her lunches and eat it all! Her classmates looked at her lunch every day. I even had parents asking me about my lunches because their child came home talking about them. Oh yes, I've heard about the book from Crystal's bento site/Twitter! It looks stunning and it's so nice of you to give one away - thanks! I love bentos because it gives you the opportunity to be imaginative/creative and think of how to use lots of healthy ingredients to create aesthetically attractive food which tastes delicious as well! It's the ultimate combination of art and cooking. Hi Lia, you don't have to put my name in the drawing for the book (our copy just arrived this weekend!). I just wanted to say hi and that I'm really glad to see you back! I love bentos because they are so appetizing and creative. They also remind me of my mother and the bentos she made for us, as well as childhood trips to Japan to visit relatives. Why I like Bentô? It's not only fun to make, but also a lot more adapted to the person it's for than any other snack one could take with one! i like bento because it inspires me to cook. it's cost-efficient and healthy because of portion control. it's also eco-friendly because you use reusable containers. I'm Lena and I would love to get this book because I really like colourful pictures to get more bento inspiration! Hi Lia, stumbled upon your blog from hopping around. You have a lovely bento site that is an inspiration with each post. I like to bento because of the portion control, and the smiles it brings to the eater (namely my husband), and of course, the perfect excuse to collect those cutie bento-related stuff. Hi Lia, I'm so happy you're back! Hope the move went smoothly for you all! I missed you!! I would love this book, I am not working summer school this summer so I have to cut back on my spending, but my birthday is coming up in August...I'll put it on my list...Either way I am definitely going to get this book...eventually! I am still so new and timid about showing my bentos. This book should help a lot. That is so nice of you to do this! The book looks great, you must be excited. I love making bento because this is such a creative activity. I have started recently but now I am always looking for new things to pack in my bento box. It also makes me want to eat more different veggies which is a plus! Finally I love how people in the bento community share their tips and ideas in a truly friendly way! LLIIIAAAA :) I've missed you!!! I like to bento because it's cute and makes me happy! I love all the people that I have grown to know in the bento community. Another added benefit is my kid is more willing to eat/try things. the reason why i love bento is simple :) i am new to bento, but they are super cute, easy to make and my daughter ( a bad eater ) loves them extrem much and finally began eating. Hi Lia, I just got this book and love it for all the reasons you describe in this post! For some reason the pages with pictures of bento tools made me especially happy! Welcome back and looking forward to more of your always splendid bentos! i love bento because its fun and my kids love bento because its cute... but the biggest reason i started bento was because of my disgust at all the garbage we were creating everyday. I love bento simply because my little sister become so happy every time I made her a bento for her ~ she's starting to eat more vegetables and less complain about the food. I fall in love with bento, when i saw a beautiful-grin on my Dira's face, when she opened her lunch box for the first time she got it. the reason why i like bento so much..
because bento is so cute n i cn make delicious n healthy lunch for my small baby brother and he ate all his lunch. (that rarely happen)(-̮̮̃•̃)i know i cn make better n more cute bento if i get this book. I like to make bento because my son always thank me when he sees his bento. I love to hear his "thank you mommy". not only that, bento box encourages me to eat healthily as the food consists of loads of colourful vege n fruits! i really want to learn bento making!! i have three preschoolers about to hit elementary and I would love to have this book as an inspiration for my bento making hobby. Now is the perfect time to start practicing!! I love Jakarta and Japan.. so, this is perfet for me!! I just want to try to do bento's so I love this book!! I am a newbie who still collecting lots of bento stuff but have no courage to make a bento since too many bentolovers (such as bentolicious for sure!) can make beautiful, pretty and cute bento. Please make my dream come true, i am dreaming of a lots bento created from my hand, just like what u did. Behold the cute! We bow down before the awesome cuteness power of your lunches. We could only wish that someone would make Us super-cuuuute lunches like this! We guess We'll have to learn to do it Ourselves. Maybe with this book, if We win it. I love the kid-sized super cuteness of bento! Pick me! I've been following your blog for sometime now and have been using it for inspiration for my own bento boxes. I'm a chef and fell in love with Japanese food when I was 7. Bento boxes give me a chance to experiment with the cuisine and combine my two loves: cute and food! My best friend of 13 years got me hooked on bento boxes and I frequently bring bento boxes with me to work for dinner - it makes everyone so jealous! I wanted to say thank you for posting so many helpful tips and tricks! Your children are very lucky! I hope one day to make the other children jealous of my kids lunches here in Canada. I like bento because it makes my kids happy, and it's easy to give them healthy food they actually enjoy eating. It's amazing what cuteness will do for picky eaters! Wah! This is so cool! Pick me pick me pick me! I am your silent reader. I always lack of idea what to prepare for my boys. I am not doing bento often, but if i got time, i will prepare it for my boys. oh thank you so much for this chance! I have been researching bento and just ordered my first box and I would love to win this!!! Bento is just so fun and anything that helps my kiddos eat is great for me!! my email is crystalbella77@gmail.com Thank you so much! xoxo! Thanks for your inspiring bento idea and you have a lovely bento site! I love bento because my kids love it and it is also one way for me to express my love to my 2 boys age 4 and 12 by preparing a cute, happy and healthy bento meal for them. Oh wow!!!! How I wish I can have a copy too!!! Coolio! bentos are so much fun to make! I just started last week because my little one is in summer fun and needed lunch daily. My friends think i'm crazy to do them and wonder how I have the time to. haha! If I'm the lucky one, this book will be the best birthday gift for me. I am SUPER new in bento making. I'm not any great cook but I fell in love with bento stuffs when I happened to look at your beautiful website through search engine. I am super addicted to browse through your informative website. I love bento making as our loves towards our family are presented in the food we prepared for them. Hi I want to win this book!! I really love bento because It so greatfull see the face of my children when I do bento for his Lunch!! He always Smile and that makes me so Happy. just a few people Knows what is bento and I cant find Magazine or book with recipies or any suplies for my bento, so I really really want this book!!! I hope win!!! finger crossed!!!! Oh, I'm drooling over that book!